by Jensen, John R.; Jensen, Ryan R.
Geospatial technologies in general ; and Geographic Information Systems (GIS) in particular ; are becoming increasingly important in our society. GIS technology is used to identify the optimal routes for emergency vehicles, to determine the best locations for various businesses, schools, and facilities, to monitor the growth and expansion of urban areas as a way to manage natural resources, and much more. 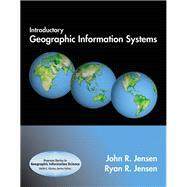 Principles of Geographic Information Systemsby John Jensen and Ryan Jensen is an ideal introduction for those who know very little about geographic information systems and spatial analysis. Relatively complex GIS principles are introduced in basic terms, often using graphics to communicate principles rather than complex mathematical equations. Content is not geared toward any single commercial GIS software program, and the book's timely, practical examples and extensive visual format appeal to today's students. This text can be used at the undergraduate or graduate level in one or two semester courses in Introductory and Intermediate GIS, yet can also be useful for professionals looking to increase their knowledge in this subject area. Dr. John Jensen is a Carolina Distinguished Professor of Geography at the University of South Carolina. He is a certified photogrammetrist, a past-president of the American Society for Photogrammetry & Remote Sensing (6,500 members), has published more than 130 articles in GIScience, and received the NASA/USGS William T. Pecora Award and the ASPRS John E. Estes GIScience Teaching Award. He has mentored 32 PhD and 65 MS students in GIScience. He has conducted more than 60 GIScience-related projects sponsored by NASA, DOE, and NOAA. He is the editor of the journal GIScience & Remote Sensing and co-editor of the Earth Observation section of Geography Compass. He is the Co-director of the GIS & Remote Sensing Laboratory at the University of South Carolina. His research focuses on the analysis of urban and biogeographic problems. Dr. Ryan Jensen is an Associate Professor of Geography at Brigham Young University and is a Geographic Information System Professional (GISP). He specializes in biogeography GIS modeling, especially related to urban forestry and rangeland. He teaches GIS courses at BYU and he was involved in many GIScience-related projects while serving as a director of the Center for Remote Sensing and Geographic Information Systems at Indiana State University. Dr. Ryan Jensen has mentored four PhD and six MS students in GIScience. He is the co-editor of the Earth Observation section of Geography Compass, and he serves on the editorial board of Applied Geography. He has published over 35 peer-reviewed articles.